Endemol Netherlands is to launch a virtual international edition of Big Brother in Second Life, the fast growing online fantasy world created by Linden Lab, to begin on December 1. From today, November 6, people from all over the world can apply to take part in the first ever virtual reality show, the winner of which will receive a tropical island in Second Life. 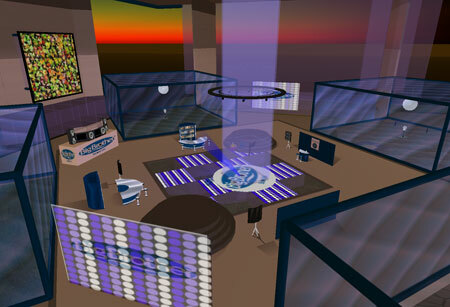 By registering in the virtual Big Brother house, candidates can apply to take part in Big Brother Second Life. 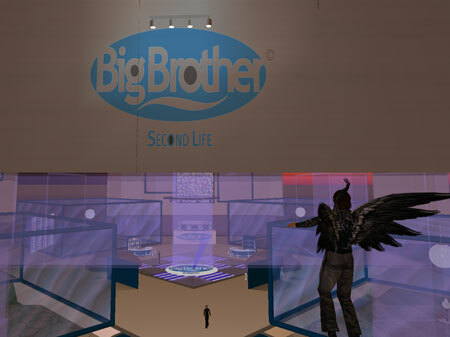 Endemol will select 15 participants from 3 time zones, who will take up residence in Big Brother Second Life as of December 1. Participants must spend a minimum of 8 hours a day in the house. Each week other avatars Ã¯Â¿Â½ animated inhabitants of Second Life Ã¯Â¿Â½ will decide which three residents must leave the virtual show. During a spectacular live finale on 31 December, the most popular resident will win an uninhabited tropical island in Second Life. Naturally intrigued I went to the Kingdom of Media Island (91,153,29) this morning and signed up as a potential contestant. There were 70 plus other hopefuls already, keen to spend 8 hours a day locked in a virtual glass cage – making furniture and buildings for a month (sounds like a normal day for me at the moment!). The pictures here show the minimalist design and how quickly a format can enter these spaces. The environmental build here struck me as a bit of a rush job, an experiment – getting a march on the many other broadcasters about to ‘play’ with other formats in these spaces. I hear on the grapevine that the BBC is about to jump in too! Endemol has managed to get there first and the hybrid format (which sounds odd to say the least) is kicking off in December and will last one whole month, over XMas. So those lucky, or not so lucky contestants will be tied to their computers over the holiday! Here are the official inworld instructions that I brought out, just for you. Big Brother Second Life. Become a resident of the first virtual Big Brother! Big Brother continues to write history. After the earthquake caused in Holland by the first series in 1999, the rest of the real world was conquered. 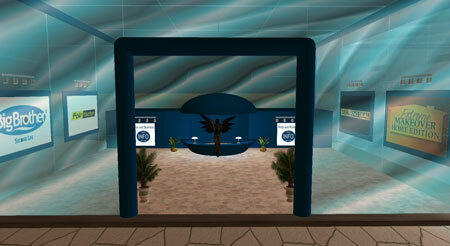 Now it’s time for Big Brother in the virtual world: Second Life. Interested? 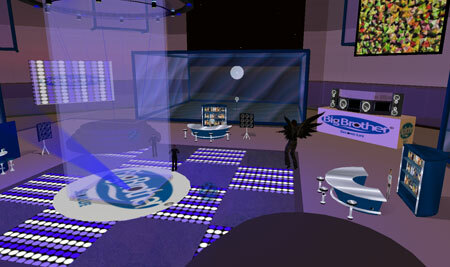 The first virtual and international Big Brother starts on 1 December. 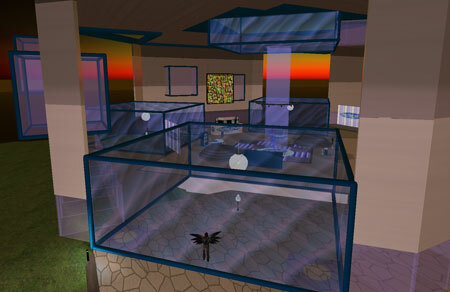 If all of your fellow residents get eliminated, leaving you as last in the house on 31 December 2006, you win a tropical island in Second Life! If you are able to spend a minimum of 8 hours a day online in the virtual house from 1 through 31 December, subscribe now and go down in history. 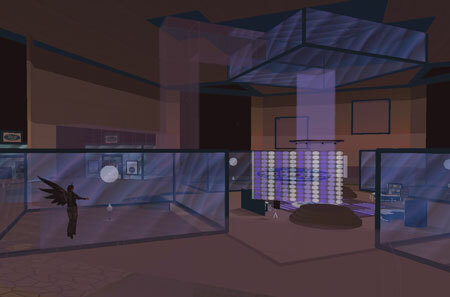 I like the idea of people wandering around these goldfish bowls watching avatars building interesting object d’art, things to decorate the ‘house’ and the large collaborative building tasks. At least some talent is required here but I am not sure a month of this will sustain in and out of world interest? I would have liked to have seen some elements of role playing and set design for elements of performance or machinima and other social skill prowess. No doubt these and other things will follow as the month progresses. I spotted some other brands in one of the glass cubes in a mall, that suggest some other Endemol formats may be on their way in. A second life Makeover, or Fear Factor or even Deal or No Deal. 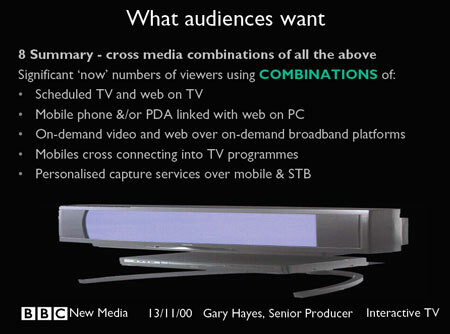 I do wonder is this pure ‘cloning’ of a TV format into a shared online virtual space makes sense? 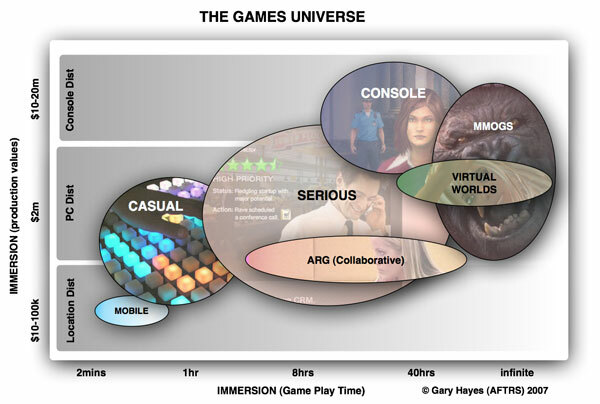 Do reality formats lend themselves to virtuality? I have often talked about the potential for things such as Alternate Reality Games IF, and only if, all parties agree to suspend their disbelief and agree on the narrative foundation. After all the contestants could teleport off to a bar or dance club when no one is around, who would know. Who is policing them when after 5 hours logged in they appear AFK for twenty minutes. The fact is that they could be sat at home watching real TV or doing a million other things. Endemol really have to keep the tasks rolling in to promote a churn of inworld audience. 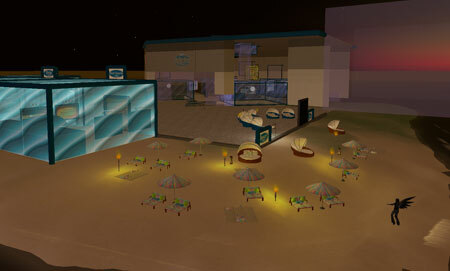 Here are the corporate ‘shops’ and beach in the distance, surrounding the studio and ‘BB House’. Free advertorial merchandise is already available. Not sure I want to become a walking billboard just yet though. 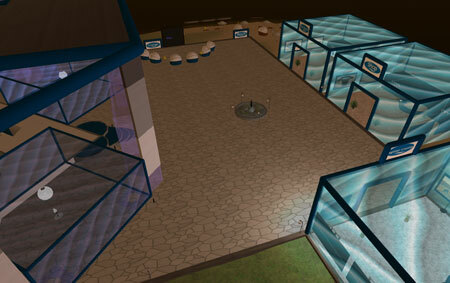 That triggered me thinking of one format that I think could be developed in Second Life – the ‘real’ big brother. A kind of reality programme (not too far off Laguna Beach I posted about a few weeks ago) that has avatars tracked and their activities monitored for real as they go about distributed quests across the whole grid. Sort of Goldrush meets BB. Next series, the real big brother in an unreal world. Of course the visitors and studio audience need a place to relax. The beach area feels a little tongue in cheek, probably took twenty minutes to drop a few sunloungers around the place. If the intention was to emulate the real world, prefab, cheap and cheerful BB then they have done well. 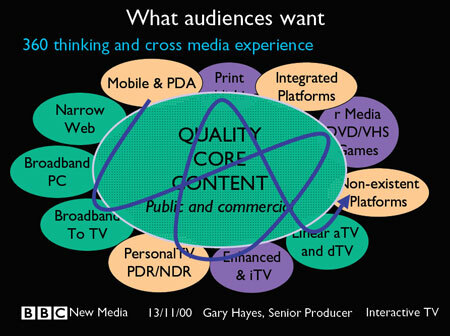 One thing I do hope SL BB develops is the usual pot pourri of cross-media in and out. SMS votes, mobile phone highlight machinimas, inworld viewer interviews and vox pops, TV slots, web profiles etc etc: I can’t imagine they are not considering those elements but hopefully develop some wonderful new ones (many of us are planning likewise) that is afforded by this ‘enhanced’ environment. The most impressive element of the BB Island was the studio come dance club which may actually be the biggest draw. A traditional SL club feel is evident which feels as if it was designed by SL regularls. But it is made more attractive with a strong ‘youth’ish’ brand and with a constant flow of tourist/audience I can imagine many folk spending their virtual dance time here, to be seen and no doubt heard. The final image shows the scale of the glass cages and how close they are to the studio central area. Nothing like the real show where the BB House is a good walk away from the ‘review’ studio audience. This felt overtly gladiatorial with a caged, ‘captive’ animal feel, a sub/dom element which certainly predominates in the world (the role playing Goreans for example). I can imagine some interesting interactions between contestants and audience will prevail. I am keen to know how they are going to police visitors and potential griefers here. Endemol do not own Second Life, there are quite a few things outside their control, vs the top heavy control of the real BB. We shall see what happens if SL is griefed beyond recognition over the Xmas break. As to the format itself. Will the audience be allowed to speak to contestants via chat or IM? That would break the fourth wall. Will they be filming highlights for broadcast TV or web clips? Will they allow existing residents, many of whom are capable camera people to capture clips and YouTube them? These are probably questions that in the early days of the form be allowed to pass without too much resistance, but over time the Creative Commons and resident owned IP will start to jar with those format owners who would probably want to control how their brand is propagated from the virtual to the real world. Perhaps my images here may cause some issues with Endemol? That aside for now we must say well done Endemol. I know there are many others planning, talking about, thinking about doing likewise, but Endemol took the leap. Risking egg on their faces but given the under the radar launch and low SL audiences, more of a sandbox format perhaps. I remember when the first real BB came out and ‘who would watch a show about people locked in a house’ conversations abounded around. I followed the first real world BB in Holland in 99 when I was at the BBC and in fact most of the ‘not gonna last’ comments came from my BBC colleagues who saw this form of reality TV as truly dumbing down. Many expectant broadcasters will be watching the SL version through December to see how this pans out. How much engagement a world full of plastic, jerky people will deliver and who knows some of us may even be ‘in’ the house. 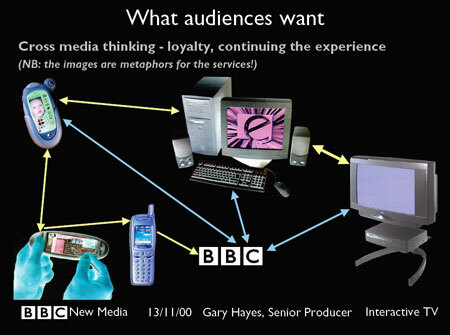 I think Endemol is the contestant here and the real audience are all the other SL hybrid TV, format creators.